Compact travelling column design ensures that the maximum working area is achieved for the smallest floor space. 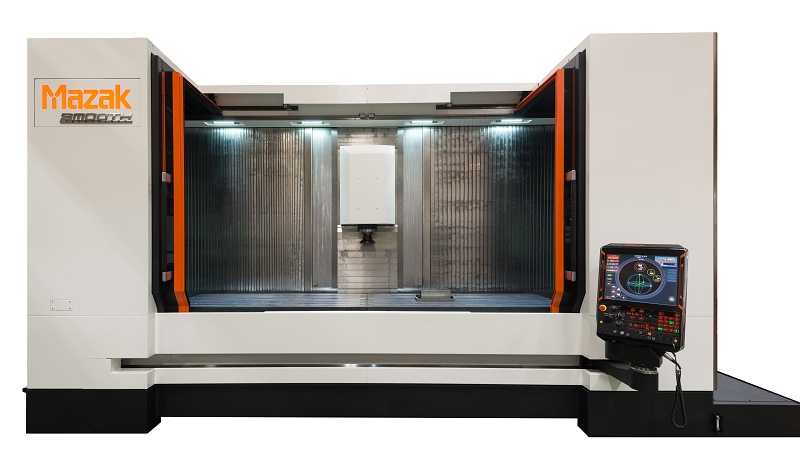 Wide door opening for craned access of large workpieces combined with adjustable CNC pendant and large windows provide the ideal ergonomic platform to maximise machine utilisation. Heavy Duty column incorporates Cross Rib Structure design, enhancing torsional stiffness delivering class leading cutting performance. The FEA designed fully cast base structure provides the rigid platform required to deliver true 50 taper Heavy Duty machining performance, providing optimised thermal stability and vibration dampening characteristics for enhanced accuracy. High Performance Automatic Tool Changer with intermediate tool change arm provides capacity for 36 tools upto 325 mm in length and 13 kg in weight. Agility is assured with the incorporated direct drive ballscrews and roller linear guide technology delivering high performance axis motion with 50 m/min rapid traverese and 0.5G Acceleration. Incorporating Mazak’s proven spindle design technology, the integral motor driven spindle with air / oil cooling delivers impressive performance -10,000 rpm, 30 kW (40% ED.) power and 175 Nm torque, critical for machining hard to cut materials.